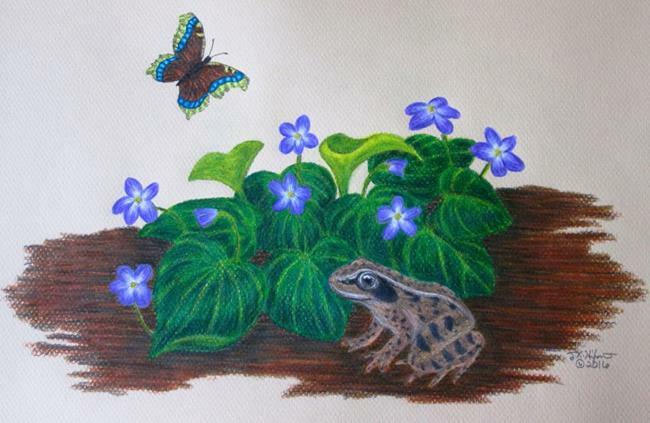 A play on words, indicating the mourning cloak butterfly and the violets, both troubadours of spring. The forest scene also includes a wood frog in the foreground. This was the first full picture I did using Lyra Rembrandt pastel pencils and there was a lot of trial and error, but I hope the outcome is pleasing. The picture is done on toned pastel paper which has a bit of texture which shows through in some areas. As an entry to the EBSQ Metamorphosis Show, it includes the obvious former caterpillar and also the possibility that the frog might turn into a prince if only kissed by the right person.